It used to be that the light in this town felt all wrong. And I know that sounds strange, but let me explain what I mean. I spent my girlhood hiking and kayaking around a very different kind of forest, on the edge of the Great Dismal Swamp. The light there was suffused. Vividly green. Humid. Looking back, there were few hard lines, and almost no shadows. Everything about the sun felt soft and indistinct. Ephemeral. This place — this is a different story altogether. The sun is harder here, and yellower. I don’t know why. And the wind — it’s a fickle, messy, capricious sort of wind, especially in Autumn and Spring. The mountains funnel it down into the valleys so that it wheels and dips. Blasts, then beds down to the ground in silence. It thrashes the clouds, shreds the high cirrus, thrusts holes in the cumulus so the light stabs through. Wine-dark stains race over the sides of the hills. The sun flashes and is gone. It took me a long time to see the beauty in this flashing sun. These fast-moving shadows. Learning photography, in my slow, plodding way, has helped. And now I am finding that I love this light. That I am so grateful for it, I want to pour it into a wineglass and watch its gold liquid shimmer like good chardonnay. Today, I stood at my kitchen window and I watched the leaves fall from the sycamore like hard snow. The wind thrashed. It punched holes in the clouds. The light came through in solid-gold bars. So I decided to go find me some Star-City sunlight. 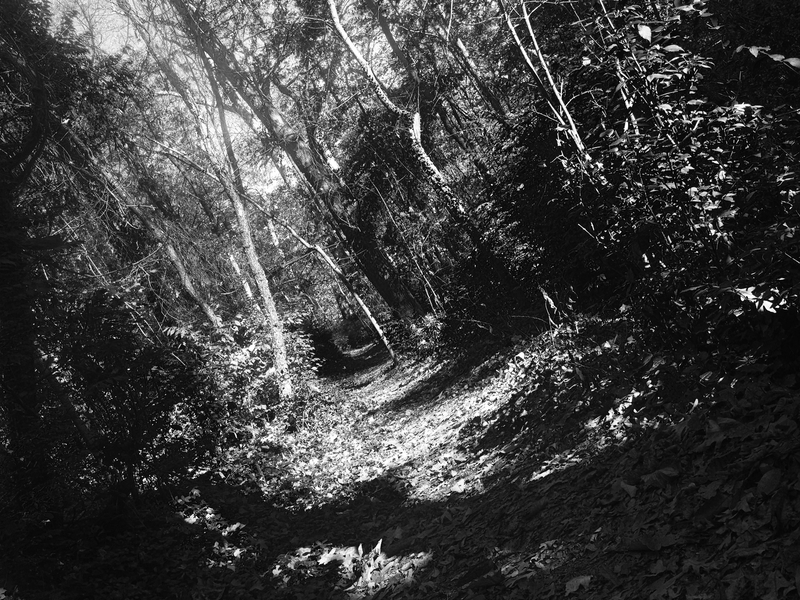 I walked in the woods with my camera. I stalked light the way some photographers stalk exotic beasts. And then I captured it. And there is nothing in these pictures, really. No objects you would take note of, to call a subject. But the light is hard enough, here, that it has form. Solidity. It moves like something alive. 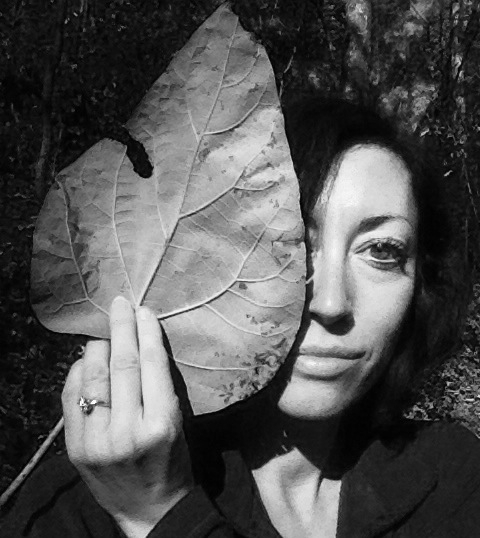 I found another giant, heart-shaped leaf today, paper-thin and big enough to wear as a mask or a handkerchief or a hat. So I photographed myself with it, standing right there in the middle of the trail. I held my face up to the sun and looked through the leaf where it glowed translucent green. I let the light obliterate the dark circles under my eyes. Let it stripe me with shadow. The wind moved in the trees and the stripes on my face moved with it. 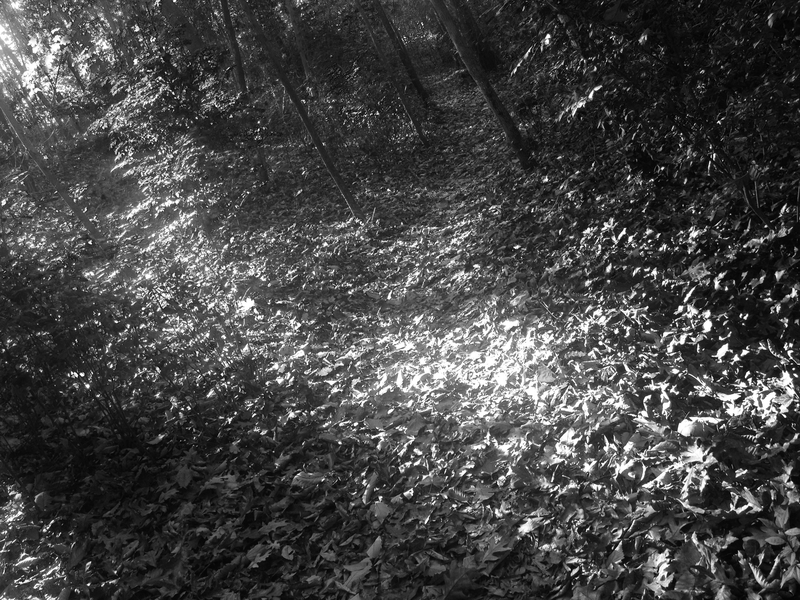 The leaves stirred around my feet and the whole forest took a long breath, like it was gasping. I took a breath, too. The Light moved through the trees like a wild thing, fierce and alive, and for a moment, as it brushed up against me, I felt just a little bit more alive, too. What you say about the wind, it is like that here too, and I am not used to it yet. It moves too much and too loudly! But the sun I know has always been hard. I would love to be there where you came from to experience a soft sun – I simply cannot imagine it. Actually I had this sudden desire to be out there with you – I think your intense sensitivity would be nothing but delight. However, you do use words so beautifully, that it almost makes up. 🙂 The image of liquid gold in a wineglass will stay with me forever. And always there will be a smile in my soul.